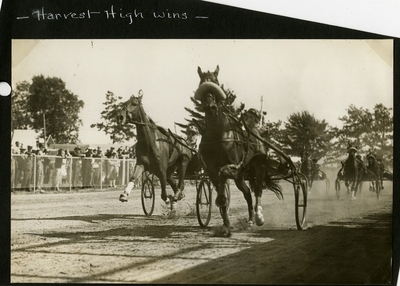 Black and white action photograph of black gelding, Harvest High (right), Hall up, setting the new track record of 2.07 1/4 in the 2.14 Pace at the South Kennebec Fair on Saturday, September 1938. Calumet Evart, wearing head number five (left) finished in second place. Don J. took the third place finish. The race was held on the South Windsor Half-Mile Track, Windsor, Maine.